Yesterday, we had a slightly ‘different’ interview on Gaming Reinvented. Why? Because it was with Shesez about his Boundary Break videos rather than a fan game or ROM hack. What’s more, it was a deliberate choice, since we’re trying to move away from offering mostly fan game and ROM hack interviews. But that doesn’t mean we won’t offer any fan game interviews at all. And today, we’ve got a new one. This time, with Super Mario Flashback developer Mors! So what’s Super Mario Flashback? Well, to put it simply, it’s a 2D collectathon Mario platformer that has Mario going through past eras and collecting stars from worlds like 1-1, Donut Plains and Cool Cool Mountain in the process. Think Sonic Generations, except Mario based. And well, entirely 2D instead of partially 3D. But enough background details for a moment. Let’s get to the actual interview! 1. Well, let’s start this interview off in the normal way then. Can you tell us a bit about yourself? Hmm… I don’t really like talking about myself, but I guess I gotta do it. I’m 18 years old, I’m from Turkey and I’m currently studying game design. That’s really it. 2. How about your interest in the Mario series? What games made you interested in this franchise? When I was very little I had a Famiclone with a 10000-in-1 cartridge. It didn’t have too many great games, but it had the original Super Mario Bros., and that’s how I learned about Mario. Later I learned about emulators and played the rest of the games, and I loved them. The one I enjoyed most has to be Super Mario 64, I just love that game. 3. And what about fan games? How did you discover MFGG or Mario fan games in general? When I was about 8 or 9 one of my dad’s friends gave me a program called Game Maker 5.0. Since I was pretty young, I couldn’t really do much with it. I think about a year later I learned about YoyoGames Sandbox and I started to spend most of my time there, downloading games and making bad edits of existing examples. I also came across several Mario fangames there, and some of them were made by a guy called Hello. If I remember correctly one of his games had a link to MFGG. I liked MFGG and decided to submit a fangame I made with one of Hello’s engines. It was pretty terrible, and it got terrible reviews, but I didn’t give up. 2 years later, at 2012, I decided to join the forums and it was one of the best choices I’ve ever made. I learned a lot about both fangames and general game design and met some great people. 4. So what inspired you to start making Super Mario Flashback? It was Sonic Generations. 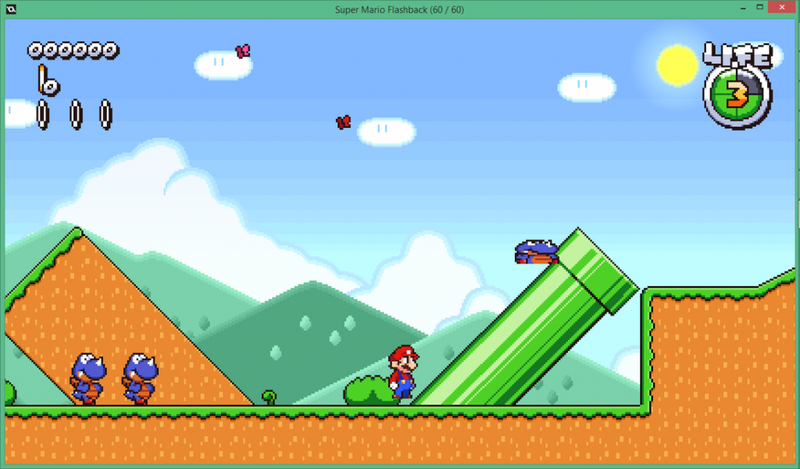 One day I thought it would be cool if Mario visited the levels from the other Mario games, and decided to make a little fangame based on that idea. But this fangame wasn’t actually Flashback. 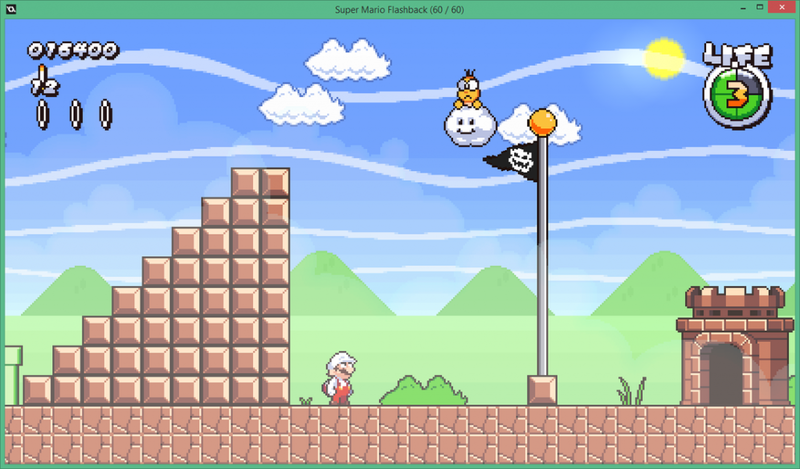 Instead, it was a completely different SMB1 styled fangame. But I scrapped it quickly after starting. 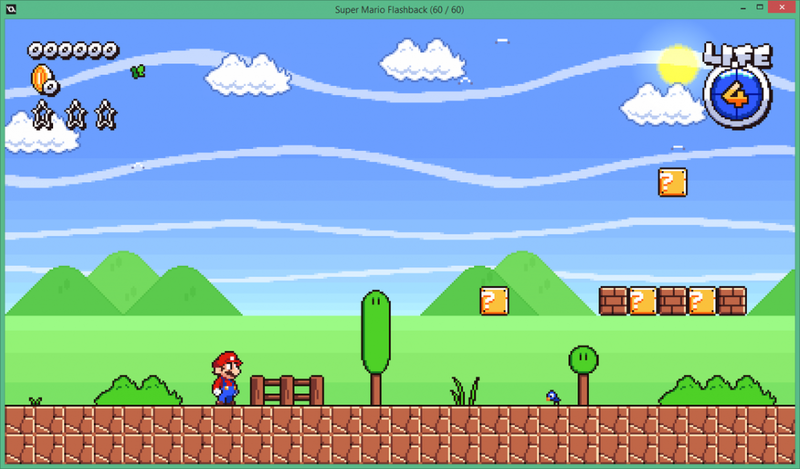 A year later, while I was still working on my old fangame Mario & Luigi’s Coin Chaos, I decided to start working on a side project that played like Super Mario 3D World and other 3D Mario games, but in 2D. But the main gameplay twist was going to be the metroidvania elements. I started working on it and made some decent progress, but then I realized it was too hard for me to execute a concept like that right. But instead of scrapping it, I decided to reuse the engine for a different fangame. I decided to give that “Mario Generations” idea another shot, but now with modern Mario. 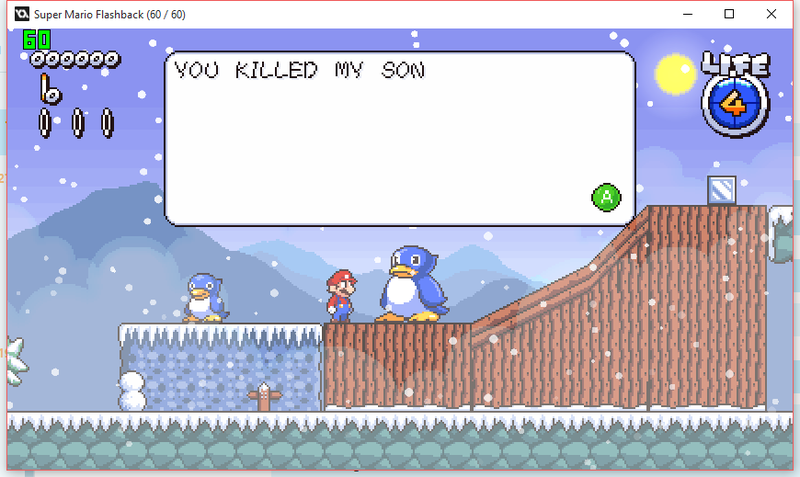 And that’s how Super Mario Flashback was born. 5. In said game, each level seems to be based on one level from each main series Mario platformer. Like 1-1, Donut Plains, Cool Cool Mountain, etc. Why did you choose these levels rather than others from the same games? I wanted to be sure the game had at least 1 level from each popular Mario level trope, while also having some of the most memorable levels from the original games. 6. What about the star collecting concept? Where did you get the idea to mix Super Mario 64’s missions with the level design of the 2D Mario titles? Making a 2D fangame with Power Stars was and idea I had for years. But I can’t say I remember how I got that idea. 7. How about the story? Is Bowser involved in this plot? Is there a final boss battle with him at the end? 8. A few people have complained about some missions being a tad hard. Do you plan to tone down any of them for the final game? When you play something over and over again it becomes harder to tell if what you’re playing is hard or not. It was the same case for me. Since I play tested the third star of Mushroom Kingdom way too much, I became really good at it and I couldn’t tell if the race was hard or not. But after getting some feedback I toned it down a bit. But if it’s still too hard, I can tone it down even more. 9. Moving away from the game’s content for a bit, the art style gets a lot of praise here for how nice and clean the custom graphics look. How did you get all the sprites to look like they’re in one style? When I first started developing Flashback, MFGG was full of SMA4 styled games and most people were sick of the style. So I wanted to make the game more unique than other Mario fangames, and started using Mit’s Super Mario Big Five-Oh oh style and the sprites he made in that style. When the fangame got bigger I realized I couldn’t sprite everything I need alone, so I decided to get some spriters such as Neweegee, Cruise Elroy, and Q-Nova. Without them, the game wouldn’t look as good and consistent as now. 10. Is the style of the game trying to look like it’s from a certain generation? Like say, as if it’s a GBA game, or late SNES game, or DS game with sprite graphics? At first, I was aiming for GBA level of graphics with a higher resolution, but later I decided to not limiting myself with trying to fit a console’s style. 11. What’s in Extras? It just says it’s not available yet, so does that mean it’s going to be something interesting in the finished game? It will have some extra DLC levels after the game’s release. These levels won’t have new art of music, but just new level designs. I’m planning to ask other fangame devs to make DLC levels too, kinda like what VVVVV did. 12. You can also seemingly send a tweet after finishing any mission. Is that part of a new strategy to promote the game on social media? I did that once recently, but believe or not that was just an accident. Before that, I only tweeted my score to showcase the tweeting feature. 13. How about the ‘lab’ in this game? The pause screen has a disabled option to ‘return to the lab’. Does this mean E Gadd is in the game? Yep. That’s the hub world of the game, and E. Gadd has a very big role in the game. But I don’t wanna give more spoilers. 14. I also noticed while playing that the new demo is very different from the old one in terms of levels, with the last one in Yoshi’s Island being completely changed. Was this in response to feedback that it was a bit confusing? It got some negative feedback but that’s not the reason I changed it. I simply thought it wasn’t good enough. 15. And what happened to online mode? That’s in the MFGG demo, but not the SAGE one. Did you change your mind about it? At first, I was planning to make Luigi and Toad available from the start in the online mode, but later I decided to make them only playable for those who unlock them. To do that I had to make it only accessible from E. Gadd’s Lab. Since the lab is not finished yet there’s no way to see it for now. 16. Yeah, I know this is probably getting silly now, but what’s with the ‘Tusk Buck’ stuff here? Will the game feature Microtransactions? Tusk Buck is a type of currency that can be shared between several different fangames. It’s based on an April 1st joke on MFGG and it was supposed to be used in several different fangames. I’m saying supposed to be because I haven’t heard much from the other fangames that were going to use Tusk Bucks. 17. Moving on from features and changes, what was it like having your game shown at a Sonic fan game convention? 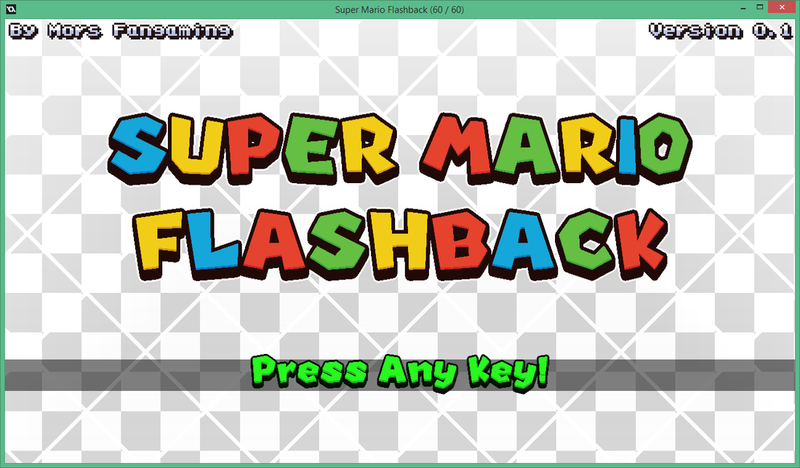 Cause it seems like Flashback was one of the few Mario related games shown there overall. How much did the SAGE viewers like it? People liked it much more than I expected, but I also think it was a bit overlooked. That’s expected, though, you can’t force every Sonic fan to play a Mario game right? 18. Over the years, you’ve submitted quite a few games to Mario Fan Games Galaxy, with the later ones getting much better reviews than the first. What interesting things did you learn about game design and development during each of these projects? I learned about the importance of planning. I used to just make games without thinking about the concept properly and come up with core gameplay ideas at the middle of the development. It seems like that doesn’t work at all. 19. And talking of progress and getting better, what are your plans for after Super Mario Flashback? Do you have any plans for even better games? Are you interested in fan games for different franchises? What about indie titles? After finishing Flashback I’m planning to stop making fangames and start making indie games. Well, I actually already started working on one. It’s still very early in the development, but designing the core gameplay elements and the main character design is pretty much done. But of course, I’m not alone on this project. Character design, story and most of the graphics will be done by my friend Cake, and just like in Flashback Can of Nothing will compose all (or maybe most of the) music. Other than that, I’ve always wanted to make a Sonic fangame, but I just can’t get any good ideas that can make it more unique than other Sonic fangames out there. 20. Finally, as a game developer, what advice would you give someone else wanting to try making their own fan game (or heck, just any game in general)? I’m not an expert when it comes to giving advice, but please don’t rely on premade engines too much if you’re new to fangame development. When people do that, the result is usually a very typical fangame that has nothing makes it stand out. Instead, make your own engine or try to change things in the engine you’re using. Give people a reason to play your fangame. And that’s advice everyone should follow, regardless of whether they’re making a fan game, indie game or setting up a non game related startup in general. Do something new and interesting, not just what everyone else is offering. So that concludes our interview. Did you like it? Did you find out anything interesting about Super Mario Flashback after reading it? If so, post your thoughts here or on social media today.